As I shuffled the cards to select this week's Intuitive Tuesday tarot card, I said, "Tell me what messages I need to bring to my readers this week." I selected the Five of Coins / Pentacles (Reversed) from the Gateway to the Divine Tarot deck by Ciro Marchetti. 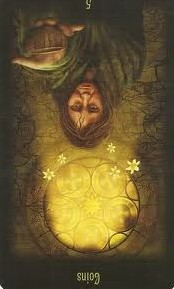 The Five of Pentacles (Reversed) is a small ray of hope that no matter how bleak it looks, there is hope. It is a reminder that you are in the midst of a cycle (and only half-way through with the five). So keep moving forward, connect with your higher self and your intuitive voice, to hear what is next. Then do it. Then listen again. Then do it. And so on. And so on. Each time I select a tarot card looking for intuitive messages, I tune in and ponder what the deeper meaning is and how it relates to my life. Other meanings of the Five of Coins / Pentacles (Reversed) is feeling more spiritually connected and/or possibly getting stuck in the small details of daily life. It's so easy to focus on the small stuff, possibly at the expense of losing track of the big picture. The Five of Coins / Pentacles (Reversed) helps you (and me) to find relief. And the very next card (knowing that this is just one stop in the cycle), the Six of Coins / Pentacles, hints at flow of money and resources -- having enough of both flowing through your own life with a desire to pass it on to others. In other words...something to look forward to. I smiled when I selected this tarot card because I relate to the Five of Coins / Pentacles (Reversed) on many levels. I've been feeling more spiritually connected recently as I release the struggles with change and moving, and allow things to flow. In not trying to control the process, I am enjoying it much more...exponentially so. One of the phrases that was included in the previous post on the Five of Coins / Pentacles (Reversed) was, "Out with the old; in with the new." There's been a LOT of that going on as we prepare to move. Every item in our house is under scrutiny. Our stuff is either moving with us, being packed for storage, given away or thrown away. It's a tedious process, but it feels cleansing too. We are moving into a smaller, completely furnished house (and returning after a year), so we don't have to take it all with us...what a relief! But then again, will it feel like home without all of our stuff in it? Will it feel like "our" home? Yes...I believe it will. Because "our" home is NOT our stuff. Our home is our family and the love we have between us. And I know that taking on this year-long adventure will draw our family closer as we embark on almost everything new...except our relationships with each other...which I believe will only deepen. As moving day approaches, I hope my sense of adventure and flow continue....and that if/when I get flustered, I gently remember the messages from today's Intuitive Tuesday tarot card. So the broader message for me today is LET GO of the old (stuff, behaviors, beliefs, trying to control things, etc.) that keep me stuck. Because when I do, it's a heck of a lot easier on me and on everyone around me. How does the Five of Coins / Pentacles (Reversed) relate to your life? What do you need to let go of? this is one that i'll leave up in my browser because i need it now, but i'll need it more than once in the days to come. As always, a very timely message for me. I'm glad you have chosen to become even more spiritually connected even as you deal with minutae (shall this paper clip come or go? ).